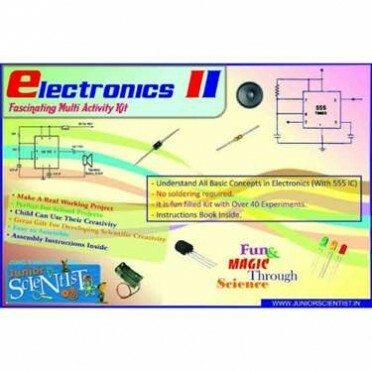 Kids will have fun exploring electronics with these Do â€“ it â€“ Yourself kit. The kit aims at facilitating children to perform 40 experiments in electronics. Features : A basic hands-on kit that introduces you to good soldering techniques while working on state-of-the-art printed circuit board circuits. You will learn the basics of digital multimeters and circuit troubleshooting.Some of the features of this kit are as follows: Identifying components, color-code reading exercises, resistors, capacitors, and inductors; includes color code calculator (Model CC-100); 163 solder points, standard soldering connections, close-tolerance soldering, and tack soldering; complete voltage and resistance analysis of circuit; desoldering exercise. This kit requires soldering.